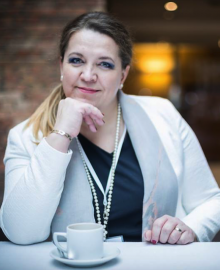 Justyna Liber is a founder of training company named Openness and Global Partner of Entrepreneurs Institute and is accredited as Flow and Performance Consultant of Talent and Wealth Dynamics. Justyna Liber is a Mind Opener for Transformational Leadership. Justyna has a corporate business background, has been working for 16 years for such companies like IBM and Siemens; always with people, it means in sales area. When she decide to go to another stage in her life, she started her new businesses but there was a huge gap (in terms of what is the best strategy to follow to have success) between working for big company and working on her own. So she start to looking for answer of the question: what is the best strategy to have successful business and successful life? Thanks to Wealth and Talent Dynamics she find the all answers and grow her business. Justyna is an inspiring speaker, trainer and mentor but mostly facilitator of change. She inspires business owners, CXO’s and leaders to build trust within their teams, what leads to high performance, productivity and happiness simply by following their flow.